Diego Pellicer is the first retail brand in the United States focused exclusively on legal, premium marijuana for pleasure and creative pursuits. They are now negotiating legal commercial import of high quality pot from Mexico, and are planning to sell the pot through retail outlets in Colorado and Washington State. Their declared intention is to expand to other states as fast as marijuana get legalized further on a state by state basis. Diego Pellicer has been founded by millionaire former Microsoft executive Jamen Shively. Jamen Shively, a former Microsoft corporate strategy manager, said he envisions his Seattle-based enterprise becoming the leader in both recreational and medical cannabis - much like Starbucks is the dominant name in coffee, he said. 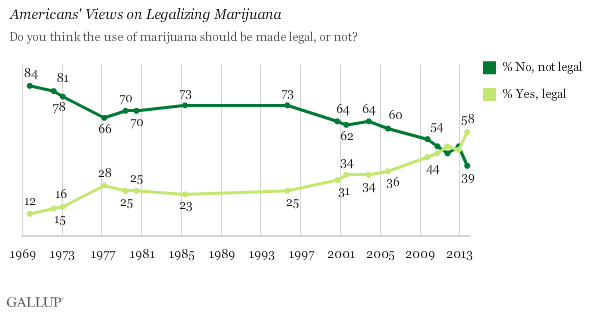 The public opinion in America regarding marijuana has shifted dramatically in the last few years. The people supporting legalization are now in the majority for the first time ever. Good call...Slowly but surely I guess. I never understood the logic behind the illegality of it besides funding the war on drugs... I wonder how much more money we can make by taxing it. Didn't the taboo start by someone in government writing a report on it with completely nonsensical info (just as much if not more misinfo as the bible)...I googled but can't come up with his name... Not Anslinger, someone well before him??? The Wall Street crowd has a very different view of marijuana than the pot heads. Agricultural hemp farming (the type of hemp that won't get you high, but is grown for its fiber and seed oil) is finally becoming legal again in the United States. Quote: George Washington and Thomas Jefferson grew hemp, but centuries later the plant was swept up in anti-drug efforts and growing it without a federal permit was banned in the 1970 Controlled Substances Act.